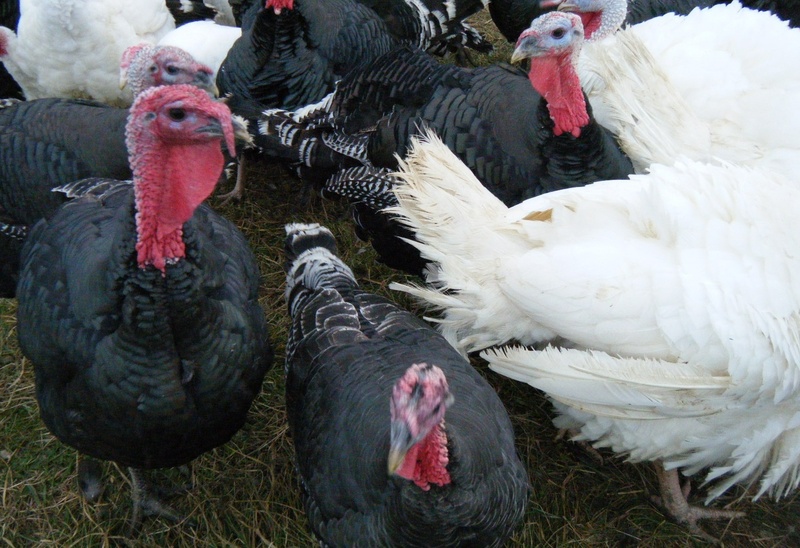 My visit to see the turkeys at River Ridge Farms disrupted their latest move from one stretch of pasture to the other. Verlinda Waters had the tractor backed up to move the large wooden roost she and her husband had built by hand. 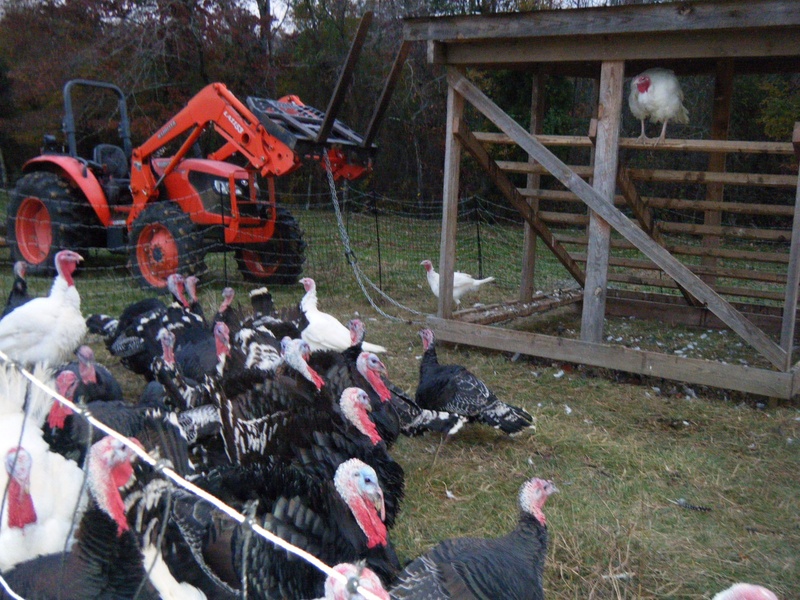 One turkey sat leisurely atop the roost while the other gobblers gathered around a water pan and their keeper was polite enough to chat with me. These preening, lavish birds were accustomed to moving once or twice a day to a fresh patch of grass. 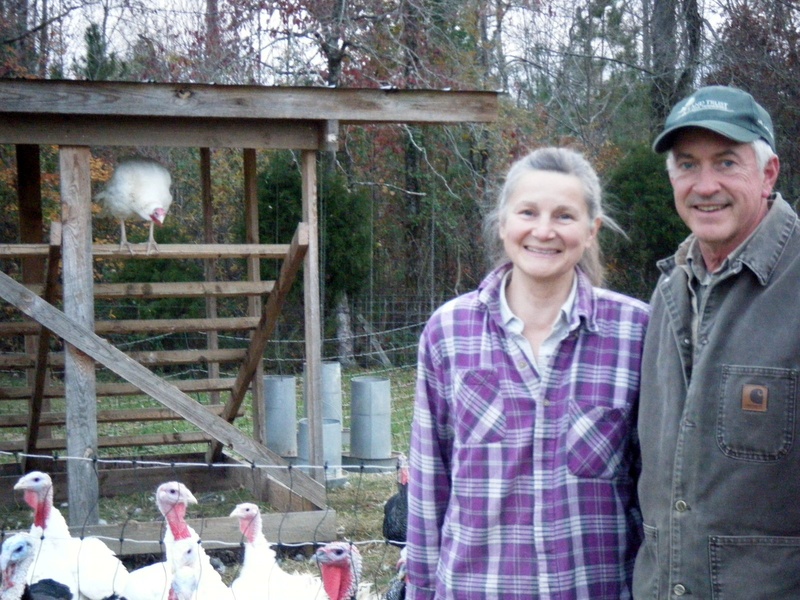 Waters, and her husband, Dave, have been busy restaking pens for turkeys, broilers and laying hens in rural Meigs County, Tennessee. Verlinda said, “Raising the meat birds on pasture or raising animals on pasture rather than in confinement and big barns, big facilities, is more natural for the animal, it’s better for the environment and the end product is healthier. 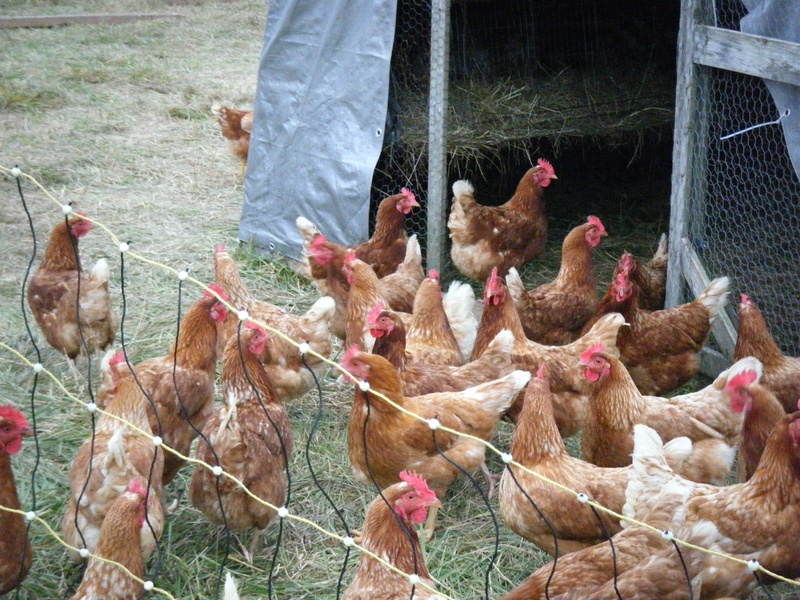 So we’re very cautious about how we raise our animals and what feed they get.” The family farmers choose to feed just certain organic grain to their otherwise pasture-fed poultry, even avoiding soy feeds over concerns about the amounts of estrogen in it. The green, open air setting is a far cry from the stench of conventional confinement methods. The laying hens were very relaxed when I went to take their picture. They seemed a bit disappointed that I wasn’t bringing them a treat, but they otherwise seemed laid back. I was privileged to get a peek at tiny pullets, Barred Rock and Red Comet crosses, that would also grow into laying hens. Plus, 3-week-old Cornish crosses were staying toasty in the wooden barn. 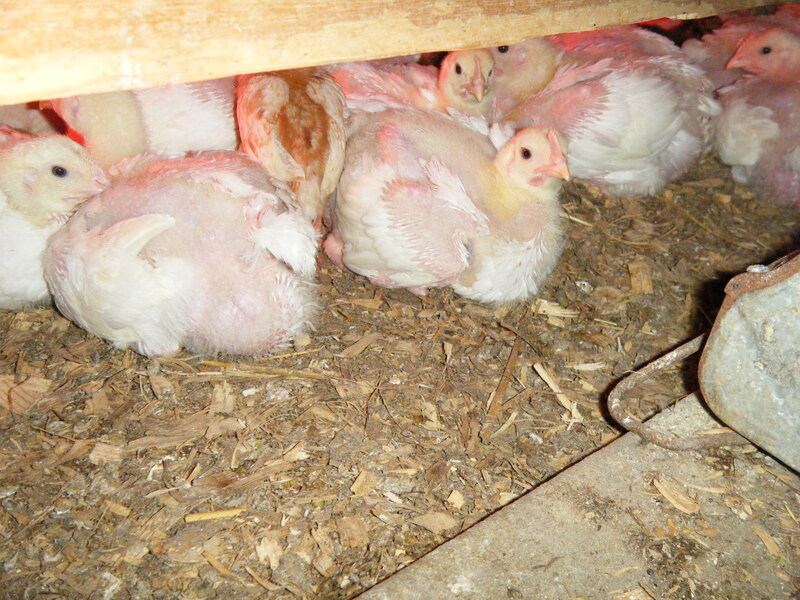 Later, they would live outdoors like the nearly full-grown Cornish cross broilers in their movable pen. 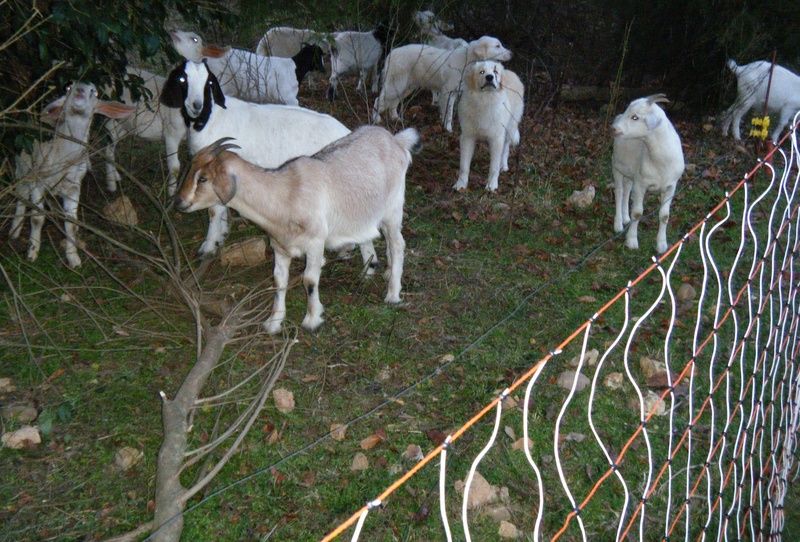 Dogs guarded the small herd of goats kept to clear brush and clean up pasture. A few cattle also rotate around the pasture. I made it just in time to see the turkeys two days before they would meet their end in a USDA approved processing facility. Customers at farmers markets in both Chattanooga and Knoxville had preordered all of the birds for Thanksgiving, at $5.75 per pound. I asked the awkward question about price and what reaction these farmers get from customers. Dave responded, “Starting out I kept my prices low to get people to buy it, but we kept losing money. So I’ve got prices set so most people think they’re too high. That’s what we need to pay bills. And we’re waiting for customers to come along who understand what we’re doing and want the quality of food that we produce.” Sold out several days before the holiday, their strategy seems to be working. Yes, these seemed to be very content birds. It’s good to see farmers getting more community support at the local markets. Great post! My husband and I were just having a conversation about the ethics of the turkey industry. I had recently read some disturbing facts. It is heartening to read about small farmers who are raising the animals in a way that is healthy for both the bird and the environment. I’m a vegetarian, but I decided that next year I will be looking for a small farm-raised turkey to bring to my omnivorous family members. Hubby and I are even thinking about raising a couple in our back yard–though I’d be concerned they’d be pets before Thanksgiving!